This Claddagh bracelet is cuff style bangle that is crafted in pewter. This Claddagh bracelet is crafted in Ireland of the highest quality lead free pewter. This pewter Claddagh bracelet is a 2" wide cuff bangle that is designed to fit most women's wrists. 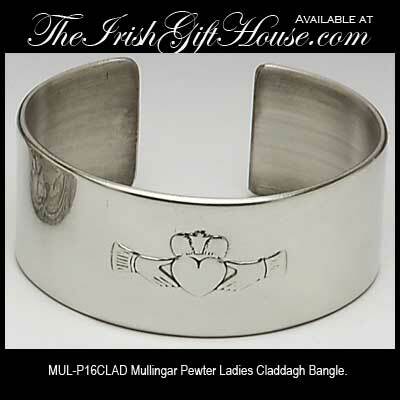 The bangle is crafted by Mullingar Pewter in Ireland and it is gift boxed with the Galway Folklore and a Claddagh history card that is complements of The Irish Gift House.